Description: Base adherent; column divided into scapus and scapulus, scapus often with cuticle and usually with numerous solid tubercles: these are large and numerous, tending to form longitudinal rows above, running onto the scapulus as vertical ridges. Tentacles arranged in multiples of six. Size up to 100mm across base. Colour white, pink, brown, red, etc., sometimes with a faint pattern on the disc. Acontia present, may be extruded through mouth only. Habitat: Usually on snail shells, particularly on the large whelks Neptunea or Buccinum (living or dead), exclusively sublittoral, from about 20m to deep water. Distribution: Previously frequent on the North Sea coast (Northumberland) but no recent records; a few old records from the English Channel. Present status in Britain unknown - Elsewhere from Scandinavia and European arctic regions. 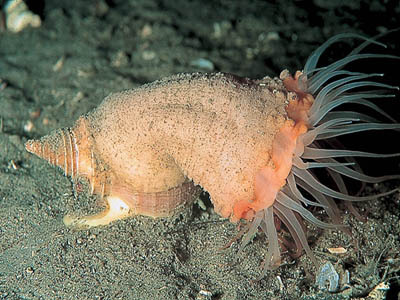 Similar Species: There are no really positive external features but few other species from the North Sea are likely to resemble this species. Of North Sea species Urticina spp. have hollow warts (not solid tubercles) on the columns. The tentacles in Urticina are arranged in multiples of ten. Picton, B.E. & Morrow, C.C. (2016). Hormathia digitata (O F Müller, 1776). [In] Encyclopedia of Marine Life of Britain and Ireland.